The Wedding Gift: Chef Julie blames the failure of her restaurant on local celebrity chef Andrew’s review and can’t believe she’s forced to deal with him again. This time she’s in charge of creating the menu for his brother’s wedding at The Rose Chalet, and while Andrew thinks Julie is talented, he wants her to take a few risks with the food. As they get to know each other better, he admits his growing feelings to Julie and asks her to take the ultimate risk…by giving him her heart. The Wedding Dance: The Rose Chalet’s florist, Phoebe, is a cynic when it comes to romance. She doesn’t believe in lasting love, especially after watching her mother bounce from relationship to relationship. But her dance with Patrick at one of the weddings in the Chalet shakes her to her core. He’s a forever type of guy who makes it clear as they get to know each other, that he’s looking for a future commitment. Phoebe isn’t sure if she has what it takes to make a relationship work, and certainly not one that would be long-distance part of the time. Can Patrick change her cynical mind? The Wedding Song: Being the DJ at The Rose Chalet has been a great job for Tyce. It’s allowed him to still work with music and make people happy, even if his own band and songwriting has taken a hiatus the last few years. Then he sets eyes on Whitney again for the first time in five years and the images of that one spectacular night they spent walking hand-in-hand through San Francisco flood his mind. Their lives have both changed but the spark between them is still there. Tyce will do whatever it takes to make Whitney understand that he needs her in his life, always. Overall, Say I Do is a touching collection of romance stories. I really enjoyed how each story set up the foundation for the next one and the common threads that were woven throughout. And, I mean, who wouldn’t want to read a book where you get to see three couples find their HEA? I liked each of the couples we get to meet and I’m torn with which story I liked the most. Andrew and Julie in The Wedding Gift were so passionate…both about their careers in the food industry and about each other. They shared a connection that was solid and even though Julie resisted taking chances, Andrew proved he could be there for her if she needed help. Phoebe and Patrick in The Wedding Dance were total opposites when it came to romance. I loved that they balanced each other out so well and how Patrick knew Phoebe better than she even realized. They were super cute together and tailor made to become a couple. I would recommend Say I Do for hopeless romantics out there like myself. Whether or not you are already a fan of Lucy Kevin’s (Bella Andre’s) writing, these stories are quite enjoyable to read. 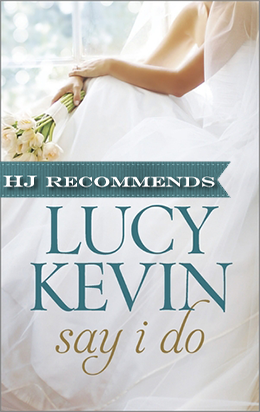 For the very first time, three of New York Times sensation Lucy Kevin’s beloved wedding stories are together in print! Set in the enchanting Rose Chalet Bridal venue overlooking San Francisco Bay, six people find love when and where they least expect it. Chef Julie Delgado and restaurant critic Andrew Kyle have a professional history that is spicy, to say the least. But when these two foodies decide to set their differences aside, they find that love is the spice in life. Phoebe Davis’s passion comes through in the bouquets she creates for the Rose Chalet’s clients, yet architect Patrick Knight has other designs in mind when he meets the beautiful florist. Whitney Banning and Rose Chalet DJ Tyce Smith might not strike the right chord when they first meet, but Tyce’s love song to Whitney shows they can make beautiful music together. This sounds like a good book and I’ve added it to my Wish List. Thanks for sharing your great review. I loved this book and the entire series. Very fun, easy reads. Sounds like 3 great stories! I didn’t know that Lucy Kevin was Bella Andre until I saw it here. I’m looking forward to reading these stories. I had seen this book & it looked good to me even before I knew it was Bella Andre’s. Now I will most definitely have to read it! Thanks for the review!